It is a transfer of ownership in exchange for a price paid or promised or part paid and part-promised. The seller and buyer are not disqualified to be transferor or transferee respectively. Property under subject should be transferable. Exchange should be for a price (may be paid or promised to pay or part paid and part promised). Payment of price should be in money form. Note; Transfer of tangible, in which underlying property is of INR 100 or more, are need to be registered. Hence additional condition of ‘Stamp duty has to be paid on such transfer as per Indian Stamp Act 1899’ also apply in such cases. It is the transfer of an interest in specific immoveable property for the purpose of securing the payment of money advanced or to be advanced by way of loan, an existing or future debt or the performance of an engagement which may give rise to pecuniary liability. The transferor is called a mortgagor, the transferee a mortgagee. The principal money and interest the payment of which is secured for the time being are called the mortgage money and the instrument by which the transfer is affected is called a mortgage deed. Interest of mortgagee, in the mortgaged property terminates upon the performance of the obligation secured by the Mortgage. Mortgagor has a right of foreclosure upon the mortgagor’s failure to perform. Mortgagor has a right to redeem or regain the property on repayment of the debt or performance of the obligation. Simple mortgage – The Mortgagor undertake personal liability for repayment. The mortgaged Property is not required to transfer to mortgagee. There is no foreclosure of the mortgaged property. Mortgage by conditional sale – Here condition being that the sale shall be absolute in default of payment by a particular date or that the sale shall be void on payment by a particular date and the property transferred. The possession of mortgaged property need to be transferred. Remedy is foreclosure, not by way of sale. Usufractuary Mortgage – Profit from the property is apportioned by mortgagee towards the advance. Property need to be transferred to mortgagee. Remedy is either the foreclosure or by way of sale. English mortgage – Property need to be transferred absolutely from mortgagor to mortgagee. There is covenant to repay on a certain day. Remedy is by way of sale and not by way of foreclosure. Mortgage by deposit of title-deeds or equitable mortgage – In this material title deed in respect of mortgaged property is only need to be transferred. All provision of simple mortgage applies to this mortgage. Anomalous mortgage – This is combination of two or more mortgages. Remedy may be either by way of sale or by way of foreclosure, depending on term of mortgage deed. Doctrine of Lis pendens (Section 52) – It states that during the pendency of a suit in a Court of Law, property which is subject to such litigation cannot be transferred. If the parties to the litigation are completely prevented from transferring the property in litigation, it would cause unnecessary delay and hardship, as they would have to wait till the final disposal of the case. So, Section 53 creates a limitation over the transfer by making it subject to the result of the litigation. Hence, ‘Property cannot be transferred’ doesn’t mean you can’t deal in property. 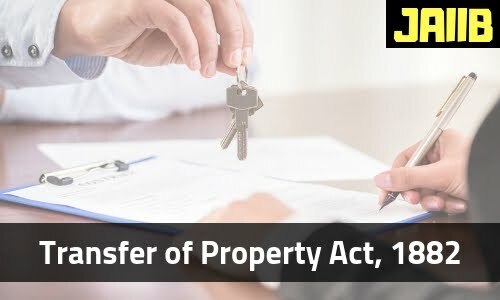 Yes, owner may enter into transfer of property, but such transfer is subject to the Court’s decree and also with prior permission. Hence, transfer may take place be with court intervention only but still subject to court’s decree. If court’s permission is not taken on prior basis then transfer is void. For example, A and B are litigating in a Court of law over property X and during the pendency of the suit A transfers the property X to C with courts’ prior permission, if this permission is not earlier taken, then at request of B, court may held such transfer void. The suit ends in B’s favour. Here C who obtained the property during the time of litigation cannot claim the property. He is bound by the decree of the Court wherein B has been given the property. It is a transfer of a right to enjoy property. Since it is a transfer to enjoy and use the property, possession is always given to the transferee. The lease of immoveable property must be made for a certain period. For example, you may give a lease of property for a definite number of years, or for life, or even permanently. The transfer must be accepted by the transferee. The transferor in case of lease is called lessor and the transferee is called the lessee, the price is called premium and the money, share, service or any other thing of value to be so rendered is called the rent. The parties to the lease (i.e. lessor and lessee), must be competent to make and to take the lease respectively.